OpLaunch enables the evolution of new product development advantages so that individuals (such as engineers, coders, graphics artists, business specialists, and communicators) can improve their collective capabilities to win consistently. Individual contributors (including engineers, coders, graphic artists, business specialists, and communicators) consider how to evolve their approach to new product development. 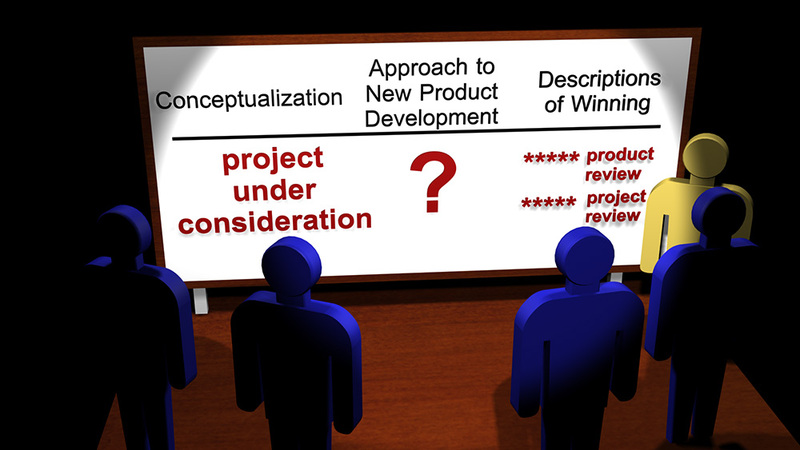 Desirable outcomes may include outstanding project reviews and 5-Star product reviews. A development options approach is characterized by synthesizing and exercising multiple perspectives, concurrent, options to maximize the development of the network’s capability to evolve expectations and self-correct focus throughout projects. Synthesis: a process of connection. Synthesis generates something new and different. A synthesis approach enables one to imagine how a series of efforts may work together to produce the desired result. Exercise: a combination of decision, action, and interaction. Exercise includes the interaction of people with prototypes. Many: more than one potential solution. Having several options reduces the reliance on the accuracy of detailed forecasts. Concurrent: more than one option can be synthesized and/or exercised at one time. Learning is accelerated. Parallel experiments, including A/B testing, are encouraged. Focus: the item for temporary, concentrated attention. The current objective. Expectations: a set of beliefs that evolves during a project. Expectations include requirements, specifications, value propositions, and hypotheses. The capabilities of the network impact the attractiveness of the development options that can be generated. Multiple development options can be active simultaneously to provide multiple opportunities to develop advantages within the project’s current constraints. 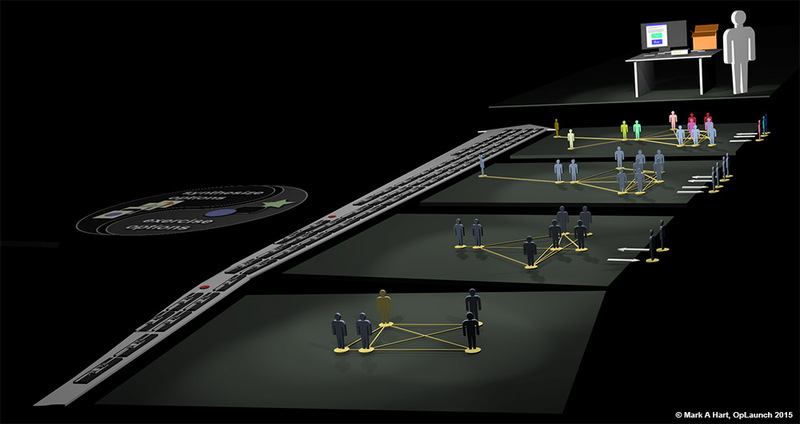 This illustration contains representations of four snapshots of development efforts from the beginning of the project to pre-launch. Individuals engage and disengage throughout the project. The arrow represents an evolved version of the focus of efforts after a change in expectations early in the project. The graphic elements within the arrow represent the details of synthesizing and exercising development options to evaluate multiple opportunities to win as well as to detect and to correct mismatches. Discontinued development options are represented using red octagons. The image in the upper-right corner represents a winning set of advantages. While some organizations rely on explicit processes to develop new products, our approach enhances the optionality of the development network to be more effective and efficient. Instead of the limitations of templates, tutorials, patterns, and checklists, our approach goes beyond compliance with explicit processes to training individual contributors to do things beyond their current ability, to do new things, to analyze the results, and to correct their mistakes. We help individuals improve specific new product development skills to improve implicit coordination, cross-functional collaboration, mutualism, and the cohesiveness of efforts within development networks. Instead of requiring extensive design efforts with rigid requirements at the beginning of a project followed by explicit execution, our approach promotes an interactive process of continuous learning. While others emphasize processes with a series of handoffs and gates, the OpLaunch approach capitalizes on multiple options across multiple domains to provide multiple advantages to win. We design development environments to improve the capabilities for better development experiences to engage individual contributors. We increase the elements of motivation (such as autonomy, mastery, and purpose) to out-perform development environments characterized by procrustean rules, mediocrity, and apathy. Our approach includes recursion (solving problems of the same form) and reductionism (splitting tasks to conform to existing silos). Our approach promotes simultaneous development efforts. Our approach capitalizes on diversity in the development network. With appropriately designed interactions between individuals of different disciplines, individuals can expand their contributions beyond their specialies to include new perspectives. This approach is more powerful than cross-training. An engineer does not need to become a marketer. A marketer does not need to learn how to code. Rather than maintaining functional silos, the OpLaunch approach capitalizes on domain diversity. A specialist can practice their craft in new and powerful ways to accomplish the objective - adding advantages to the development effort. Our approach facilitates pair development to synthesize better perspectives. Pair Development is implemented by facilitating the interaction of individuals from different disciplines (such as a coder and a marketer). Activities may include (1) dialog and sketching or (2) creating prototypes and analyzing outcomes. Pair development produces more insightful perspectives. During new product development, pair development improves the qualities such as flow and harmony. OpLaunch enables individuals to shape their approach to new product development to improve their potential to win consistently. The OpLaunch name is based on an approach that includes synthesizing and exercising better development options that contribute to a cohesive set of advantages. Launch provides the critical moment to win. Mark A Hart founded OpLaunch in 2001. 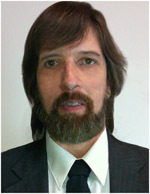 He is a new product development practitioner and researcher that has collaborated with colleagues to commercialize new products (such as measurement systems for scientists and engineers, software, computers, and training applications) that have produced billions of dollars in revenue for technology companies. Hart is a certified New Product Development Professional, NPDP. Our strategic approach builds on the work of John Boyd. 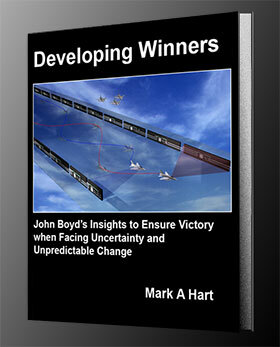 OpLaunch founder, Mark A Hart, will publish a book titled "Developing Winners: John Boyd’s insights to evolve your capabilities for victory when facing uncertainty and unpredictable change" in 2019.
Who will you designate as 'Launch Architect?